Tuning Forks instaneously alter your bodys biochemistry and bring your nervous system, muscle tone, and organs into harmonic balance. 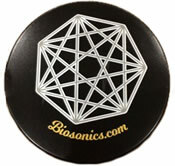 Sound alters our biochemistry and enhances all energy therapy practices. Individuals use Tuning Forks to relieve everyday stress, as an aid to mental clarity, to enhance yoga and meditation, and as a pain management tool. Doctors, psychotherapists, massage therapists and energy practitioners use Tuning Forks to generally enhance all phases of their work. Our tuning forks are made from special aluminum alloy rather than stainless steel. Our aluminum tuning forks cost approximately 50% less than stainless steel forks and do more with equivalent or better quality in terms of sound. Our scientific research indicates nitric oxide is conducted with our aluminum alloy tuning forks. Aluminum tuning forks are more affordable, versatile, and easier to use than stainless steel forks. Our aluminum forks sustain longer pure tones as well as ring sustained overtones. Thirty years of feedback from practitioners has let us know that the aluminum forks are easier to use, and are indeed the preferred fork in terms of clarity of the sound, tone, and cost. 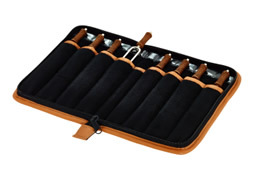 This kit contains a Crystal Tuner and a pocketed carry pouch for protection of the tools when not in use. It also contains a clear quartz crystal. Anytime! Anywhere! The vibrations of life fill up wherever people are, even when you are making an attempt to keep the space clear. You may clear your space daily, or more often if you like. Many people clear space before they do certain work, healings, meditations, or ceremonies. You might like to clear the space around yourself at your workplace, or in public rooms, or when you are traveling and staying in hotel or motel rooms. Use your intuition and imagination. The frequency is calibrated, exactly like a medical instrument, creating an exceptionally clear tone. The precise sound gives consistent, discernable results. Convenient: the small size allows it to be carried in a pocket, purse, or tucked in a suitcase when traveling. With normal use, the tuner is guaranteed to never wear out or break. Teachers use it to clear classrooms between groups of students. Health practitioners use it between clients to start fresh with each session. Travelers use it to chase away old energies in motel and hotel rooms. Individuals use it to clear unwanted energies from apartments, houses, and cars. Speakers use it before meetings, to clear old energies and to connect the group. Anyone can use it to generate a clear open space for learning, thinking, and creating, or to clear a room after an unpleasant episode. This quartz crystal is special. It comes to you, through us, directly from the mine in Arkansas, USA. Its energy is pristine; this crystal has not been used for any other purpose before this one. It is a natural point, meaning that it comes from the ground exactly as you see it. Any dings or imperfections in the shape are naturally created and contribute to your crystals desirability for this purpose because the energy of the crystal has not been tampered with. Quartz crystals possess an awareness of their purpose, and not every crystal is appropriate for this use. Your crystal has been specially selected and lovingly tested for use in the Crystal Clearing Kit. By demonstrating its ability to sound a clear, sweet tone, this crystal has agreed to be a part of the Clearing Kit. The crystal in your kit is the perfect size for clearing smaller, personal spaces. Use it in your aura and to clear space between 2-6 people (such as your family or group of friends). If you are clearing space in a room, begin in one corner (or a spot that feels right, like opposite the doorway), and clear the space in front of you. As the energy begins to move, take a few steps in any direction, sound the fork, and feel the energy continue to move. Follow the movement until you get to a window or corner; turn yourself in another direction, and continue to move the energy. Do this until the entire room is clear. If you are working with larger, more public spaces or with groups of strangers (like at a workshop, or co-workers) a larger crystal will be useful. Larger crystals make a stronger sound, and move more energy faster and farther away. Please use care in the selection of a crystal. Find one that fits comfortably in your hand, is fairly clear, and relatively free of internal fractures. You should feel some sense of affinity for the crystal and the purpose. Try it out, and identify how the sound feels. We look for a sweet tone, and all over sense that the crystal is happy being used in this way. A crystal is a living being, so please be respectful of any messages you seem to receive from it. A crystal that doesnt want to be used for clearing purposes will have a duller, flat sound. If you use it anyway, it may choose to explode or crack. How to use: lay the clear quartz crystal in the palm of one hand, and hold the Crystal Tuner by its handle with the other hand. Gently tap the flat part of the fork tine on an edge or the rough end of the crystal (not on the tip). The Crystal Tuner will vibrate and sound. Keep your hands about 18 apart, and reach out towards the space you want to clear with both hands, allowing the energy to flow both between the crystal and the crystal tuner and also flow out into the space. Sense the energy move out into the room, like waves of water moving away from a tossed pebble. Envision a receptacle, such as a trash can or a black hole, filled with white, cleansing light, positioned outside of the space you are clearing, and send the energy into the receptacle. Repeat several times, each time sensing the movement of the energy as the sound and vibration push all other vibrations away, out towards the edge of the space. If clearing a space larger than about 10 x 10, move yourself to different locations, and repeat the process. How it works: The fundamental tone of planet Earth is 8 cycles per second (cps). The Crystal Tuner sounds at 4096 cps, 9 octaves above the frequency of earth. This 9th octave frequency appears to open doorways to the angelic kingdoms and the realms of spirit guides, so by sounding the frequency, you are accessing higher realms. Being a member of the mineral kingdom, the quartz crystal represents the planet earth, and the sound created by the crystal and the tuning fork bridges heaven and earth. When the quartz is held in the hand, and the tuner is held near it, you can actually feel the vibration flow through the quartz. The frequency of the tuning fork is also opening space between the molecules of the quartz, allowing it to be energized and reflect more light. This sound, light and energy moves away from the source (you) in waves of vibration, acting much like the waves in a pool of water. Additional use: Use the Crystal Tuner to clear and refresh all your crystals and stones! Strike the crystal with the tuner to get the vibration started. Then, place the stem of the tuner on the crystal and hold it there for a moment or two, allowing the vibration to totally enter the crystal and clear it. Or, if you prefer, gently wave the vibrating tines of the fork over as many faces of the crystal as convenient, and the vibration will surround the crystal, and clear its energy field. This technique will work to clear other stones also. Achieve a state of deep relaxation in seconds with the primordial vibrations of OM. Physically tune your body to the OM vibration and enter a state of balanced wholeness ideal for healing and higher consciousness. Helps center the body and mind when placed on the rib heads, thoracic vertebra, sternum, sacrum and illiums. Helps meditators and yoga practitioners achieve desired states effortlessly. In India this tone is the keynote of the Sitar and Tambura Also the sacred syllable "OM" is tuned to this tone like most religious music. The rishies or spiritual master of India believed that the musical tone sadja or sa, which means the father of all others, to be the musical sound which resonates with the never ending primordial vibration OM. The rishies arrived at sa through deep meditation. To this day, Indian musicians approach tuning their instruments as a meditation to set the Spiritual tone for a whole concert. The effect of Indias meditative music is based on a musicians ability to tune to sa. The Swiss scientist Hans Cousto, author of the Cosmic Octave, discovered how to convert planetary cycles into musical pitches. Using his system the sa corresponds to the sound of one Earth year of the time it takes the earth to circle the Sun. To arrive at the frequency of 136.10 Hz, an earth year is reduced to a second (frequencies are measured in cycles per second). An earth year is 365.242 days and an earth day is 86,400 seconds. When the days are multiplied by seconds the answer will be 315,567,925.9747 seconds equal one earth year. To arrive at an audible sound, 315,567,925.9747 seconds are divided into one (year) and then raised 32 octaves. The result will be the audible tone of answer 32 times the result will be 136.10 Hz. The cosmic note OM. You can use your OM fork directly on the body and acupressure points by tapping your fork in the same way. With the finger or thumb of your free hand, locate the spot on the body where you want to place the tuning fork, then tap your fork and press the single end of the forks stem onto the spot. Make a firm contact and hold the tuning fork until you feel the vibrations stop. The Om fork is especially effective when placed on the rib heads, thoracic vertebra, sternum, sacrum and illiums. For example, tap the OM fork and press it to your sternum. Close your eyes and feel the vibration. After a while hum OM in resonance with the vibration. Another way to use your OM fork during bodywork sessions is to apply it to the spinal processes of the back and/or directly onto the sacrum (or any bone in the body you wish to bring the harmonic resonance of the OM vibration). Review: "After my great aunt's death, the family condo was left uninhabited after 25 years of family residence. Once it had sold, I physically cleaned the condo, then, wanting it energetically cleared as well, I used the OM tuner, touching it while it vibrated to every surface in the condo, including cabinets, door jambs, walls, floors, even windows. The next morning, an intuitive friend of my great aunt's came to help me move the last few items out of the condo. She didn't know I'd planned on doing any energetic clearing. She walked in the front door and stopped, amazed, saying the condo felt completely empty, there was no sense of my great aunt at all, and the condo felt like a blank slate. My daughter and her boyfriend have been doing a major remodel of a house they're about to move into. My daughter has asked me to help clear the house energetically and the OM tuner will be an integral part of that process." Beschouwd als de oerklank waaruit alle andere klanken zijn voortgekomen is de OM klank een uitstekend uitgangspunt voor mensen die geïnteresseerd zijn in het helen met klank en geluid. Veel ervaren klankgenezers werken met deze toon. Deze OM stemvork klinkt op de toonhoogte van 136.10 Hz, in het middenbereik, overal beschouwd als de klassieke OM frequentie. De OM klankvibratie werkt zowel ontspannend als energiegevend. Het mee resoneren met de OM frequentie kan de ademhaling verbeteren, spanning in het lichaam oplossen, hulp bieden bij concentratie, meditatie en het omgaan met pijn, en is een uitstekende achtergrond bij yoga. De klankgolf die deze stemvorken voortbrengen werkt als een soort kinetische energie die disharmonie en spanning uit het lichaam verdrijft en tegelijkertijd een gevoel van welzijn teweegbrengt. De Ohm stemvork is gemaakt van een speciale aluminium legering gebaseerd op ruimtevaart technologie. Hij zal nooit ontstemd raken en blijft na het aanslaan lang doorklinken. OM, Aoum, is een heel specifieke frequentie (136,10 Hz) die al in de oudheid bekend stond als de meest krachtige trilling. Wij adviseren om ook de cd's "There is No Place Like Ohm" Vol. 1 en 2 te gebruiken tijdens therapie sessies (deze CDs zijn te koop bij Merlyn). De OM klank interfereert op indrukwekkende wijze met de stemvorken, het geeft meer diepte aan de sessies en vult de ruimte met de Ohm klank. De cd is ook een goede begeleiding bij het het "OM chanten", het wordt als dynamisch en bevrijdend ervaren. De Synodic Moon (Luna) stemvorken hebben een wat specifiekere toepassing. Algemeen wordt aangenomen dat de maan verbonden is met het element water. Ons lichaam bestaat voor het grootste deel uit water, en het reageert ook op de maan, net als de getijden van de zee. Vanwege die relatie zijn deze stemvorken bij uitstek geschikt om aandoeningen te behandelen die te maken hebben met de lichaamsvloeistoffen: vocht vasthouden, verstopping bij sinussen en longen, artritis en chronische gewrichtspijn. Toepassing van de Luna stemvorken, in het bijzonder in combinatie met het Om (de Ohm stemvorken) om zo de planetaire Vijfde te vormen, helpt om zachtjes vochtophoping te verspreiden ofwel zachtjes vloeistoffen naar een plek te brengen (de waterhuishouding wordt verbeterd). Dit proces kan op dieper niveau beter plaatsvinden in het hele netwerk van meridianen door het openen en de productieve mogelijkheden van de Vijfde. De klankgolf van de Luna stemvorken maakt een meer specifieke opening van energiestroom mogelijk. De klanken dringen zachtjes door, waarbij verstopping en stagnatie worden opgeheven, zodat de levenskracht (Qi) weer kan doorstromen en de centrale energiebanen in het lichaam weer geactiveerd worden. The Otto tuners are used for relaxation, the sound vibrates into the bones for relaxation. The Otto Tuners are tuned to the frequencies of 32Hz, 64Hz and 128Hz. They vibrate at a low pitch and due to their weighted ends the sound lasts longer than that of regular tuning forks. Their frequencies are based on an 8Hz fundamental tone raised in octaves (i.e. 8Hz, 16Hz, 32Hz, 64Hz, 128Hz.) The 8Hz fundamental, which based on the pulsation of the planet earth, is the generating tone for all our tuning forks. Otto Tuners are available in three Different Frequencies: 32, 64 and 128Hz. It is recommended to start with the Otto 128. The 32 Otto is especially effective for stimulating nerves on the skin and hair. Tap it by the body as described and than lightly touch your skin or hair with the edge of the tuning fork body. You will fell it stimulate, vibrate, and tug at your skin and hair. You can also tap the fork and move it very slowly across an area just above your skin without touching. The Flower of Life tuning represents the origin of all things through sacred geometry. The collaboration of numbers, shapes, and vibration belongs to the oldest myths of mankind. It is the strive to connect with our origin and to understand oneself. The frequencies of the Flower of Life Collection is one step on the journey to this goal.The Flower of Life Tuning Fork has especially been designed to transfer the vibrations of the Flower of Life tuning into ones body. The "MI" 528 DNA Repair tuning fork is the third note of the original 6 Sacred Solfeggio frequencies is "Mi" for "Miracles" and is 528 Hz. It is the exact frequency used by genetic engineers throughout the world to repair the blueprint of life, DNA, the healthy core of which is a six-sided crystal of structured water. Mi 528 Hz DNA repair refers to a collection of processes by which a cell identifies and corrects damage to the DNA molecules that encode its genome. Genomes are subject to damage by chemical and physical agents in the environment (e.g. UV and ionizing radiations, chemical mutagens, fungal and bacterial toxins, etc.) and by free radicals or alkylating agents endogenously generated in metabolism. DNA is also damaged because of errors during its replication. The Body Tuners are a wonderful way to begin your sonic exploration. They are a set of 2 tuning forks, the C and the G. These notes create the special interval in music and sound therapies, called the Perfect Fifth, that balances the energy systems. Listening to these two different tones, your body makes one tone, bringing your whole nervous system to balance and integrating your mind and body. Within 30 seconds (the same amount of time it takes to stretch a muscle), you can achieve a state of unification and deep relaxation, which might take you 45 minutes to reach through meditation. Review: "I tried them on children in pre-school where I am working. They love the tuners. It helps me to centre myself very quickly." Tune your body to the healing sounds of Pythagorean Tuning Forks. The Solar Harmonic Spectrum is a full octave of tuning forks (C, D, E, F, G, A, B, C) in a beautiful velvet pouch. Each interval affects your nervous system in a different way by activating a chakra, a specific elemental quality, and a corresponding color. The Solar Harmonic Spectrum emanates pure sounds and overtones to help you relax and center yourself. Each interval relates to a different state of consciousness and body posture, and supports overall balancing. 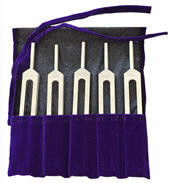 This set of 8 tuning forks is the basic tool for sound healing. The plus and minus elemental signs refer to stimulating and sedating qualities. For example C & E creates an outgoing stimulating Fire while C & A creates and inward sedating Fire. The interval of C & A was considered the interval of the mystic by Edgar Cayce and other psychics. The Christian roots of Solfeggio go back to a Gregorian Chant titled The Hymm to St. John the Babtist written by Paul the Deacon in the 8th Century A.D.. The hymm contains the original Do Re Mi although in the those days it was Ut Re Mi. Ut was changed to “Do” in the 1600’s and the change from Sa to Si is lost to antiquity. The lyrics to The Hymm to St. John the Babitist are: "Utqueant laxis Resonare fibris Mira gestorum Famuli tuorum Solve polluti Labii rreatru Sancte lohannes". The Latin text translates as “So that your servants may sing with clear voices the wonders of your deeds and wash the guilt from their stained lips.” My modified translation based on my knowledge of sound healing is “So that we, the servants of the divine, may sing with tuned voices, and bring ourselves in resonance with the wonders of your vibrational universe”. Solfeggio is based on a natural system of tuning called Pythagorean tuning. Pythagoras the Greek was a philosopher and mathematician who lived from 570-­‐ 496BC. In the West, the intervals of the Solfeggio are at least 1500 years old. In the East in Indian classical music, the equivalent to the Solfeggio is called sargam. Sargam is an acronym that represents musical tones similar to Do Re Mi. The sargam system for singing and chanting tones has been used in India thousands of years and is also based on natural intervals, Sa Re Ga Ma Pa Dha Ni. The Angel Tuners are based on the ninth octave of the overtone series. In the overtone series a fundamental tone creates a second tone and the second tone creates a third tone, etc. These tones ascend in pitch. This rising in pitch of the overtone series represents the archetypal images of Jacob's Ladder and the stairway to heaven. Alexander Scriaben, a Russian composer, believed ninth octave overtones would bring forth a new era and unite Heaven and Earth. His last composition "Mysterium" was to be played in India using bells hung from clouds sounding these overtones. With a frequency tuned to the pulsation of the Earth, the Crystal Tuner amplifies the healing power of crystals through sonic vibration. Enhancing a crystals ability for light conduction and powerful sound healing, when tapped on a crystal, this tuning fork forms a bridge between Heaven and Earth. When you lightly hold the Crystal and Crystal Tuning Fork, a pulsating wave moving between the tuning fork and crystal may be felt. The Crystal Tuner is tuned to a frequency of 4096 cycles per second (Hz). This frequency is generated from an 8 Hz fundamental tone raised nine octaves (i.e. 8 Hz, 32 Hz, 64 Hz, 128 Hz, 256 Hz, 512 Hz, 1024 Hz, 2048 Hz, 4096 Hz.) The 8 Hz fundamental resonates with the pulsation of the Earth. The ninth octave of the upper overtone series begins with 4096 Hz and is said to open the doorway to angelic kingdoms. Alexander Scriaben, the Russian composer, believed that this octave united Heaven and Earth and would bring forth a new era. His last composition Mysterium was to be played in India using bells hung from clouds sounding ninth octave harmonics. Hold a quartz crystal in one hand and the crystal tuning fork in your other hand. Gently tap the crystal fork on the rough end (not the point) of the crystal. Close your eyes and meditate on the sound as well as the feeling of the crystal in your hand. When working with another person, hold the crystal off the body with the point towards the area you want to energize. Gently tap the rough end of the crystal with the tuning fork. Let the sound move gently into the persons energy field. Visualize it with color and/or spinning in a positive direction. There are many possibilities for the Crystal Tuning Fork. Let your creativity and healing ability be your guide. 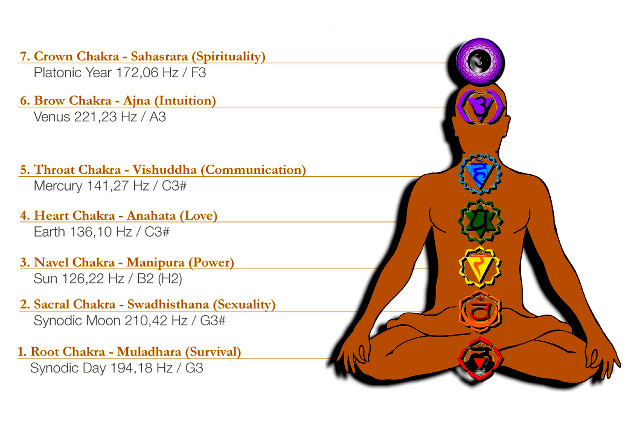 The Chakra Tuning Forks are a set of 7 forks tuned to the vibration of each of the traditional Hindu chakras. They were discovered by a Swiss mathematician and musicologist Hans Cousto. The Chakras are said to be "force centers" or whorls of energy permeating, from a point on the physical body, the layers of the subtle bodies in an ever-increasing fan-shaped formation (the fans make the shape of a love heart). Rotating vortices of subtle matter, they are considered the focal points for the reception and transmission of energies. The Chakra Set is a set of Tuning Forks that can be used with the chakra system. There are 7 Tuning Forks in this set. It is based on the mathematical rotation of the planets around our Sun. These forks are NOT based on a musical scale. They work more on the cosmic multi-dimensions of our chakras, our not-noticeable bodies or subtle parts. They also work on pathways as well as other gateways of energy. The planetary cycle of the solar system is used to arrive at accurate formulae on which these tuning forks have been created. This links them to our cosmic multi-dimensional selves. This self is eternal, not noticeable and approachable through layers, ladders, gateways and manifold levels of energy. These tuning forks prepare pathways to a Cosmic Universal understanding of Life and our Soul's infinite relationship to it. In comparison, it is unlike the Harmonic Spectrum Set, which is tuned to the Pythagorean Scale (also known as the Just Scale) and is more in touch with the physical plane of existence and works at a more physical level. The physical plane is more concentrated, crystallized in definite form, cognitive and revolves around the 5 human senses and various parts of our physical body like the tissues, fluids, bones, organs, etc. The Swiss mathematician and musicologist Hans Cousto has developed them. Brain Tuners are based on brain wave studies using electroencephalography (EEG) technology to map different states of consciousness known as Delta, Theta, Alpha, and Beta. Delta is associated with deep sleep. Theta is associated with meditation and dream states. Alpha is associated with relaxed awareness, creativity, and heightened learning. Beta is associated with high alertness and focus. When the Brain Tuners™ are simultaneously sounded - one in the left ear and the other in the right ear - the two hemispheres of the brain function together to integrate the two sounds, creating a third, different tone called a binaural beat. When the Fundamental Brain Tuner tuning fork is sounded with a Delta, Theta, Alpha, or Beta tuning fork the difference between the two tuning forks creates a binaural beat which is heard as a pulsation. The binaural beat gently signals the brain to shift into a different state of consciousness. When we go through a 24-hour cycle, we shift into different states of consciousness determined by our life requirements. One can visualize a car that shifts into different gears as necessary to meet the requirements of the road, i.e. a low gear for pick up and climbing hills, a medium gear for slow driving, and a high gear for highway cruising. In a similar way, living our life requires shifting into "different gears" for different situations. The following table will help you understand what state of consciousness you're in as well as the state you would ideally like to shift into. The graphics show the EEG rhythms the brain produces in that particular state of consciousness. Hold your tuning forks by the stems with moderate pressure - not to tight and not to loose. Do not hold your tuning forks by the prongs because the prongs need to vibrate in order to create the sound. This round rubber pad is used for striking the tuning forks on . It can be used instead of the knees for easy striking , so the tuning forks vibrate at the maximum vibratory rate. Activating Tuning Forks on the body is not recommended, as injury can occur. This Activator works well with all Tuning Forks, weighted as well as unweighted. Hiermee wordt de stemvork geactiveerd. Kan voor alle stemvorken gebruikt worden. Doet uitstekend dienst in alle situaties waarbij men zittend werkt. Sacred Sound: Through this visual experience of how sound affects your physical body you will acquire a foundational understanding of how sound healing really works. This DVD will make you better equipped to use your BioSonic tuning forks or listen to sound healing CDs. Bija Mantras and Chanting: Bija means seed. The Bija Mantras are the seed sounds of each lotus pedal of the chakras which when whispered, spoken, or chanted can activate elemental energies for balancing life energy. They can be used to activate and balance the five elements for healing. Toning: Toning is the art of making healing sounds to free your voice and heal your body and emotions. Voice Energetics: Dr. Beaulieu shares his thirty years of experience on evaluating and using our speaking voice for healing. The applications of Voice Energetics can be used to refine your listening abilities for heightened communications and increased effectiveness in verbal counseling and psychotherapy. Five Element Theory Evaluation: Using the five elements of ether, air, fire, water and earth, you’ll learn how to enhance your communication skills in your relationships, career and everyday life experience. The Five Elements are fundamental to life and healing. 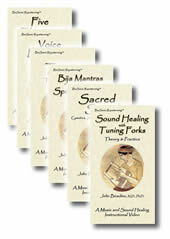 DVD "Sound healing - Tuning fork application"
DVD met instructies voor gebruik van stemvorken (Engelstalig) Deze DVD geeft aanschouwelijke instructies en onderricht bij 20 manieren van behandeling, waaronder de basistechniek voor stemvorken, tempo van toepassing, werking van het lichaam en toepassingsmethodes voor het fysieke en het energetische lichaam. LET OP: De dvd heeft dezelfde inhoud als de dvd in de set "Sound Healing with Tuning Forks" plus DVD - Marjorie de Muynck. 20 manieren om iemand anders te behandelen, met gebruikmaking van acupunten en anatomische zettingen. DVD "Cymantics Soundscapes and Bringing Matters to Life With Sound"
This documentary is truly awe-inspiring, detailing the inherent responsiveness of matter to it’s underlying vibrational tone. It is both visually fascinating, and immediately comprehensible to anyone with an interest in the natural sciences. CD "Calendula: A Suite for Pythagorean Tuning Forks"
Allow the pure, beautiful healing sounds of Pythagorean tuning forks to elevate your mind and center your body, creating harmony and balance. By listening to this unique healing experience performed by Dr. John Beaulieu, you’ll move through different sacred spaces to help you gain flexibility in many life situations. This musical, sound healing CD is a musical journey intended to raise your consciousness and use as a tool for consciousness exploration.